10 Top Activities for Family Day in Toronto! Every once in a while, the AGO gets a little crazy and turns into the KGO letting kids take over. Family Day is no exception. Inspired by the current Jean-Michel Basquiat exhibition, Now’s the Time, this year’s Family Day activities look awesome. It includes beat box, breakdance and hip hop fun with UNITY Charity, “Tag” art-making (graffiti), and visiting the new Kids’ Gallery Pets and Me exhibition. Besides that there are art making activities, KGO gallery tours, big floor games, and family yoga. Check it out here. The Toronto Marlies are taking on the Binghamton Senators at the Air Canada Centre at 1:00 pm. Tickets are available here. Family Day is big at the Toronto Zoo with lots to check out and explore. Dress warm and head outside to learn about the families and siblings that can be found at the Toronto Zoo. Also stop by and say goodbye to my buddy Humphry who is headed to Winnipeg now that he is 1. More info here. Open all weekend and from 9:00am to 6:00pm on Family Day, Family Fun Fest transforms over 30,000 square feet at Downsview Park into a large INDOOR FUN Zone. The festival features over 30 rides, activities and attractions including Kiddie Rides, Jumping Castles, Giant Slides, Interactive Games, Fun Foods, Arcade and Carnival Games. More info here. In every corner of the Ontario Science Centre, you will find something fun on Family Day. From live science shows and demos to age specific sessions in the Planetarium, your kids will literally have a blast. More here. Kicking off at 10 am and running until 3 pm, the Sears Great Canadian Chill invites you to cross Polar Bear dip off your bucket list while helping to end cancer. Not your thing? There are also ice sculpting activities, food trucks and a fun kids zone. Open on Family Day, the auto show has something for everyone. Don’t worry about your kids being bored. On site there is an Xbox One Gaming Area as well as the Volkswagen Children’s Playcare Centre. The Playcare Centre features complimentary child care and kids activities like arts and crafts and dress-up stations. Family passes are available for $45 for 2 adults and 2 kids (7-12). Kids under 6 get in for free. More info here. Maybe not the first thing you would think to do on a Monday in February but the Toronto Waterfront is hosting a whack of activities from Woofjocks Canine All Start show at Paws Way to guided tours of Queen’s Quay Terminal. Bring a travel mug as local businesses are providing free hot chocolate! More info here. In the same area, you will also find the HarbourKids Skating Festival taking place on Sunday February 15th and Monday February 16th. The party happening at the Harbourfront Centre is offering fun activities on and off the ice including group skating events, storytelling, craft-making and imaginative play zones. More info here. How ready are you for the Pan Am Games? Casaloma is opening its doors for a big Family Day event featuring live gymnastics demonstrations, the chance to meet Pan Am athletes, cultural arts and crafts and dance workshops as well as kids activities and face painting. The world’s most adorable porcupine like mascot Pachi will also be onsite for photos. Get ’em now before he is a real celeb. Check it out here. Don’t forget about all the action happening in the Toronto beaches. From ice slides, ice sculptures and lumberjack shows to the ultra cool display Winter Station Contest Winners display going on on the beach this is a good year to head east. A ton of businesses area also open and offering everything from kids temporary tattoos to hot chocolate, free yoga and free movies at the Fox Theatre. For more click here. 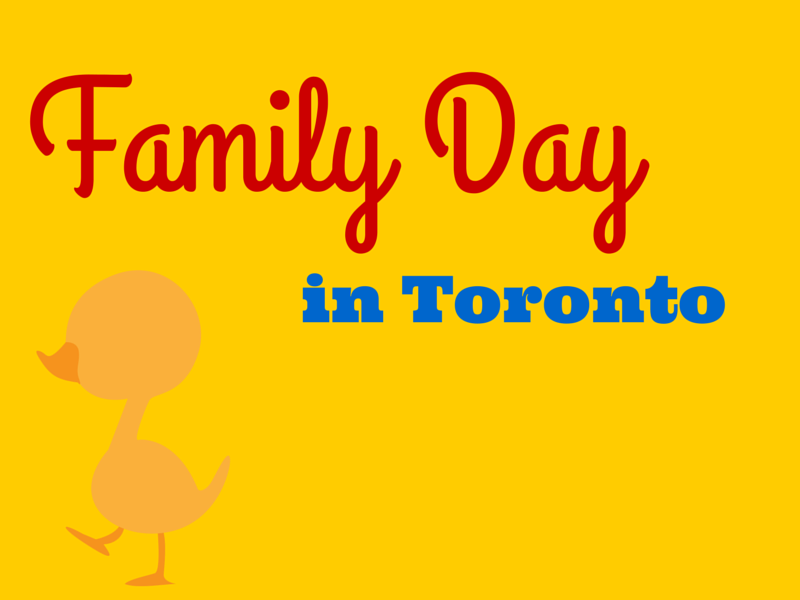 So what are you going to do for Family Day in Toronto? Don’t forget to check out this list of things happening on Saturday for Valentine’s Day!